I'm still playing Offworld Trading Company in Early Access, and mostly, it's because Soren Johnson has added a new mode. The mode is the "Daily Challenge", and it's a single map, one round. I can play through the map in 20-30 minutes (sometimes less), and it's a perfect mode for jumping in, having fun, and going on about my day. This is absolutely a terrific and fascinating game. What I mentioned previously about the end game being abrupt is still a sticky issue, but but I don't think it will be intractable. On the plus side, it's remarkably intense in a very positive way, and I'm still having loads of fun playing. The second game I want to mention is Cities: Skylines. Mod support has waned substantially in the last few years, because if a developer supports mods, they can't sell that same content to you via DLC. But this is a short-sighted view, and here's why. In the case of Cities: Skylines, the game shipped with full mod support. Because of that support, there are already a ton of interesting mods available for the game. That's a superb rendition of, um, "Down-N-Out" burger. I've seen one of those buildings in real life, and it's a tremendous duplication. It's incredibly easy to put it into the game--again, full and convenient mod support--and it's just another little bit of reality that looks great in my city. The problem with releasing a game is that you can, in almost all cases, never duplicate the rush of publicity you get during the launch window. EA, as an example, had to consciously prime the publicity pump for Sim City after its release, because without them doing it, it wasn't going to happen. With mod support, though, Paradox gets free publicity and interesting content. Eurogamer and Kotaku have both mentioned the Down-N-Out mod today. Mod support extends the launch window publicity honeymoon. Companies like Bethesda have mod support that has kept games like The Elder Scrolls III: Morrowind in the news for over a decade. Sure, it's intermittent news, but the larger mods have also kept people buying the game long beyond the point where a non-modded game would have any interest. You know what else? The mod makers become personally invested in the game. Support them, and they will act as evangelists for your game. That's very, very smart. Okay, last note. 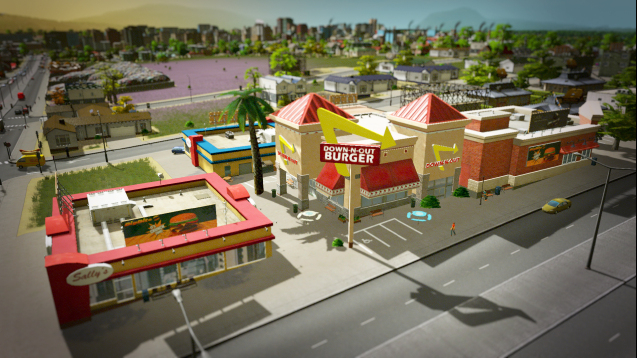 The artist who made the Down-N-Out mod is a former Maxis employee (Bryan Shannon) who worked on Sim City and was laid off. So now he's making buildings for Cities: Skylines, and he launched a Patreon to hopefully establish some level of financial support for his work. That's great. Shannon estimates that it takes 15-30 hours to create a building with this level of fidelity, and if a market exists to fund his work, it's another example of how mod support can create positive outcomes. This game is a happy story, and it's happy because Paradox didn't get greedy, and they weren't obsessed with control.